Do you love the content on Internet and want to read it later? Many times while surfing on Internet, you often come up with lot of websites which is very informative for you and want to read it later. But you save the link or bookmark the website or the blog every time you like the content. This task of adding the links wastes lots of our resources and time while you are working. It just breaks the flow of work. This situations also arises when you are on a move and accessing Internet from your mobile phone or tablet devices. While surfing the Internet you come across many sites which you think you could save the link but you cannot do so. To beat such a situation you can start using GetPocket. This is a web app which helps you to save the content of websites and blogs. You can easily add web articles, images and videos. The best part of GetPocket is that there are lot of applications associated with it, so you can use this app on your iPad, iPhone, Kindle Fire, Windows Phone, Blackberry, Android devices and many more. 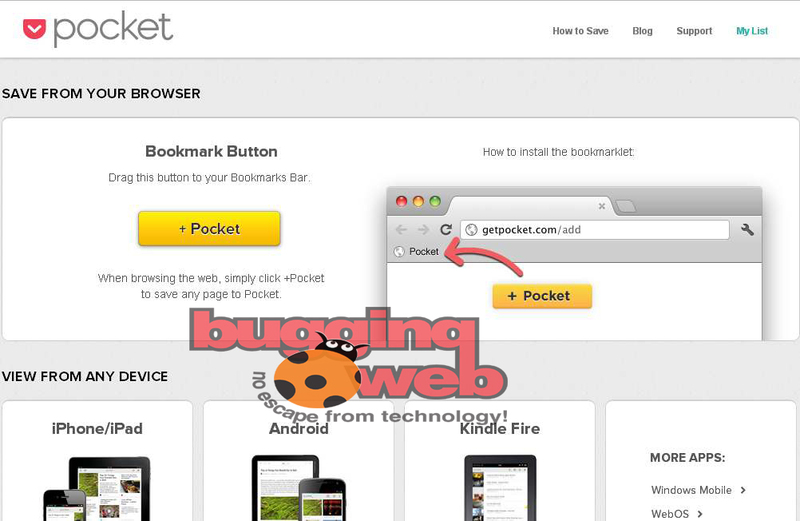 The support to various devices as application is the best advantage to use GetPocket. It archives the web content and helps you to go through the content later on. This helps you to enjoy the content very well later on. GetPocket was earlier known as Readitlater. This web application is free to use, which helps to save your world of Internet in it. Once you have read the content you can mark the article as read, favorite or delete the article. If there is more confusion or you are not able to search for the content, easy way is to search the article in search bar. Tagging can be done while saving the article for easy accessibility of the article. The User Interface is very simple to understand and very clean with easy availability of options. The success of GetPocket is with the huge database of more than 300 supported applications(like Flipboard, Pulse, Zite and more) which can be integrated in your browsers and various mobile devices. To take the maximum use of this service, you can even add up your favorite link by authenticating the application with twitter or just sending a mail to add@getpocket.com with containing the body as various links to be archived. You can easily backup all your archive with a few click and making the list of links in a HTML file. Am loving this web app very much and hope you all enjoy reading articles later and won’t miss any informative content on Internet. Click here to start off with this web app. « How to start downloading with Torrents?